The Advantage 50' Expanding Garden Hose with Nozzle is a high performance dual chamber garden hose that automatically expands up to 3X its length while giving you a powerful high-flow water spray. Simply watch our hose expand and contract as your water is turned on and off. Our strong and ultra lightweight garden hose will not twist, tangle or kink and the accordion design allows for ease of use and compact storage. No more struggling with heavy traditional style garden hoses. The Advantage Expanding Garden Hose simplifies your work around the house and yard and is perfect for all your outdoor watering applications !!! The DuPont Kevlar Hose is a lightweight industrial grade hose that features innovative technologies to provide the best watering experience yet. Our patented Quick Repairable Couplings allow you to reattach the hose end in the event of accidental damage. So, no matter what abuse you throw at this hose, it remains reliable. The sturdy Kevlar fibers serve as an external shield, ultimately protecting its integrity throughout a lifetime of watering jobs. Lastly, kinking is a thing of the past, as Polyfusion Technology, promotes flexibility even if the hose is stepped on or bent. The DuPont Kevlar Hose is great for all your industrial, agricultural and irrigation needs! 50 ft. length x 5/8 inch diameter. 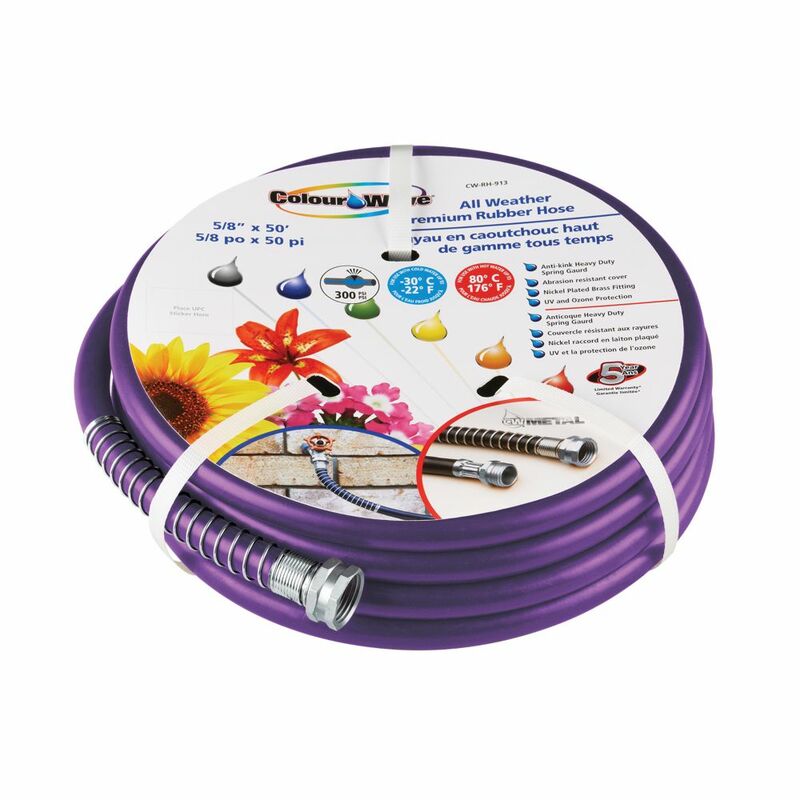 5/8" x 50' Premium Rubber Garden Hose - Purple All weather premium rubber hose 5/8" x 50'.Anti kink heavy duty spring guard. Abrasion resistant cover. Nickel plated brass fitting.UV and ozone protection.